The Beats Powerbeats2 are a solid pair of sport-friendly wireless earbuds that hold up to the competition in everything but price. A solid pair of wireless earbuds - we’d just prefer to see them priced closer to the competition. The small box that holds the Powerbeats2 has a clear plastic window up front designed to show off the headphones without opening the box. Tearing off the plastic strip on the bottom of the box allows you to pull this panel off to get at the headphones themselves. Underneath you’ll find a short USB cable, a carrying case, and the manual. The Beats Powerbeats2 are available in two different color options. We’re looking at the classic black and red color scheme for this review, but they’re also available in an iDevice-friendly white and gray color scheme. Like most of their competitors, these earbuds are IPX4 water resistant. This means they’re resistant to sweat and splashes of water, but you don’t want to dunk them in the sink. Unlike many sport-focused headphones and like the original Powerbeats, the Powerbeats2 eschew the now-popular in-ear wings for around-ear hooks. This is mostly going to be a matter of personal preference, but for what it’s worth, I do prefer the over-ear hooks. This made for an easy fit, and I found these headphones to be more comfortable to wear for extended periods than headphones that secure themselves inside the ear. Unless you’re the type who immediately reads the manual on opening up a new product for the first time, you might have a hard time finding the power button on the Powerbeats2. It’s located on the left earbud, on what would be the top when you’re wearing them. It’s technically possible to use this button while wearing the earbuds, but it’s much easier to turn them on, then put them on. After turning the Powerbeats2 on, they’ll immediately enter pairing mode, so just pair from the device of your choice and you’re good to go — an audible chirp from the headphones will let you know that pairing was successful. Like most Bluetooth devices, range is stated at 30 feet, and I was able to move around freely within this range without any dropouts. Aside from the power button, all of the buttons are located on the remote near the left earbud. Beats made what is in my opinion a wise decision and prioritized volume control over track skipping. The remote has a button in the middle to pause / resume playback and answer / end calls, but the other two buttons are volume-only. In wireless earbuds, I definitely find this more important than skipping tracks. When opening up the box, I spotted a warning from Beats that I should charge the Powerbeats2 for at least 15 minutes before trying them on, and that 15 minutes of charge time would get me roughly an hour of listening time. Good to know. Overall battery life of the Powerbeats2 is stated as six hours, and I found this to be a fairly accurate estimate. While longer battery life would certainly be welcome, the USB cable fits easily in the carrying case and it’s not difficult to plug these in for a few minutes here and there to keep them charged. Speaking of keeping them charged, make sure to turn these off when you’re not using them; there doesn’t seem to be an auto-off feature. While many of like our earbuds of the noise isolating variety to keep outside sounds from annoying us, the Powerbeats2 take a different angle. These are intended specifically to let ambient noise in on purpose. This is done to keep athletes safe while training, which is good if that’s what you’re looking for, but be warned that these may not save you from that crying baby next to you on the plane. The lowest mids can sound a little boomy, depending on the track, but overall there is a nice clarity to the midrange; it isn’t cut as drastically with these as some other Beats headphones I’ve tried. There seems to be a slight boost in the vocal range, but nothing excessive. The highs seem to be slightly rolled off at the very highest frequencies, likely to prevent harshness and save your ears from frequencies you may not even hear. Again, this isn’t overdone, and details were very noticeable in the high end. Soundstage was surprisingly solid with the Powerbeats2. Obviously earbuds aren’t going to compare to an open-back pair of headphones, but I was still impressed. No distortion was noticeable as I pushed the volume up, but this could vary depending on what you’re listening to. The bad reputation Beats has among audiophiles is only half-deserved at best. Some of the company’s products have indeed been truly bad, but that was in the past. Their recent releases have, with one exception, been on par with their competitors. That exception? Pricing. 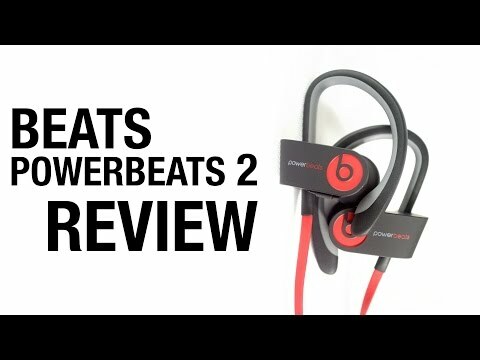 The Powerbeats2 are a very nice pair of wireless earbuds, comparable to the Jaybird BlueBuds X and the Jabra ROX. The problem is that these will cost you around $70 more than either of the competitors without offering anything more. These headphones have differences certainly, and if those differences — ambient noise passthrough, over-ear hooks instead of in-ear wings — are important to you, the Powerbeats2 will suit you well, but they don’t really justify the inflated price.